So, that’s our dumb faces up there, stomping grapes and enjoying it way too much, haha. 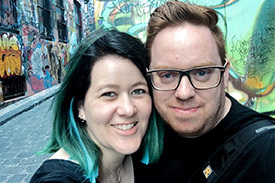 Hi, we’re Glen & Fiona Holdaway. By day we’re an awesome wedding photography duo, and by night we’re expert movie critics. (Look, honestly, we use the term “expert” pretty lightly there). We’ve been married 6 years now, together for 15 years, and we can tell you first hand, there’s no greater feeling in life than finding & marrying your soul-mate. Nawwww. 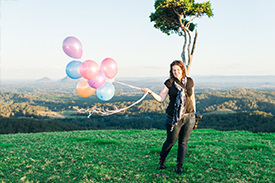 We started shooting weddings about 7 years ago up around Noosa in Queensland. Then, 2 Years back in 2016, we decided we needed a sea change so we left everything behind except our cameras and TV and we moved down here to Victoria. Melbourne, and the Yarra Valley specifically, is a place we really love. It has a real warm & fun vibe that is close to our hearts and it was always the place we holidayed to every year, so it definitely made sense to make ourselves locals. We’re based in Balwyn, roughly halfway between Melbourne city and the start of the Yarra Valley for us, so we can focus on those rad areas with our business. 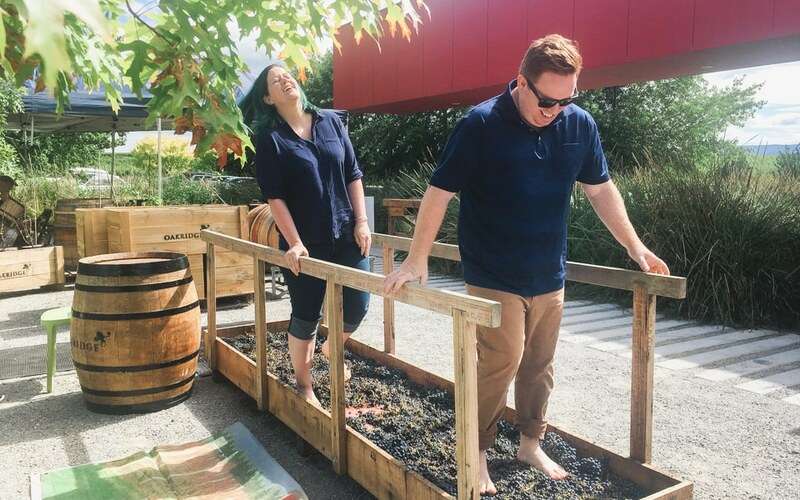 Close enough we can jump on a tram and head to the city for a coffee, or just a short drive out to our favourite wine-tasting hotspots in the Yarra Ranges. We love travelling, chasing sunsets and exploring new places (feel free to give us any location tips) while holding hands and just wandering around seeing where the day takes us. We’re arch-rivals when it comes to coffee vs. bubble tea, or red wine vs. apple cider, but we align on so much more, and that makes us the perfect team. We’re passionate about spending time with our family & friends; for heading to food truck parks and trying new street foods; date nights out at the cinema watching the latest superhero films and cuddling up on the couch binging on Netflix for far too long. To be a little corny: We believe in growing old, not growing up. We also believe a wedding should not simply be a “wedding”, but rather an awesome party to celebrate the marriage ahead. Two people committing to each other for the rest of their lives, surrounded by their closest family & friends, and then living that marriage – that’s pretty damn awesome. 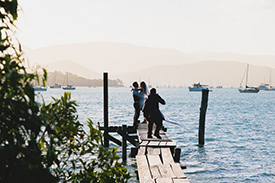 This will sound corny too, but who cares – we believe getting married is the coolest thing two humans in love can do. What’s your spare time look like? I love to watch old films – Love it. Like the original star wars movies, pulp fiction, robocop, that sort of thing. There’s something awesome about the practical visual effects of the day that brings a smile to my face. I love to take photos, obviously, that’s my job… but I do try and challenge myself with something a little different to the daily grind, like a little street photography shooting in black & white only, or filming video and making little vlogs (maybe one day soon I share these). Travel photography is a huge passion right now – nothing better than that. If I could go back to New Zealand every year for a snowboarding holiday and photograph the sun as it sets over the snow-capped mountains of Queenstown every evening, I’d be a very happy dude. We’ve not long landed in Melbourne so there’s plenty to explore, so that’s kept me very busy. Films and Netflix at night for sure. One of my weird hobbies is always learning and researching stuff. For the last two years I’ve been studying Spanish, starting my day with 15 minutes learning some new words using a language app. It’s been awesome to learn another language and challenge myself, definitely fun, so that fits in here. I’m also a huge podcaster, so I’ve got a nice list of podcasts I subscribe to that get a work out daily, either during my morning coffee or walking around the block. On the list right now is the Gary Vee podcast, Moment of Clarity, and Collider Movie News podcasts. I could eat Nando’s every day – shout out to the peri-peri sauce. Mexican food is always on my radar, and I’m partial to a thai red curry too. Ok, I like spicy food. Most of all, I love to cook at home and get creative in the kitchen when I have time. Nothing better than throwing together a quick stir fry with pak choy and wild mushrooms. Everything. Seriously. Back in the day it was Foo Fighters, Blink 182, Green Day & New Found Glory. Currently, I’m keen on stuff like Of Monsters and Men, Passenger and Bastille – and that’s just the short list. Music is a big part of my life. My spotify premium account certainly gets a workout. Fiona. My family. Good friends. My hard drive backups?!? The opportunity to travel, laugh, smile, and spend time with those who I care the most about on earth. What causes or organisations do you care about? I’m a big fan of this home & school for disadvantaged children in Guatemala. We’ve been lucky enough through our success in wedding photography to be able to donate some money every year to their cause. The work they do is awesome: saving children from poverty, and providing them with education and a safe place. It’s called Casa Guatemala, you can find them at www.casa-guatemala.org. “Glen & Fiona were amazing. We knew they were the perfect fit when we spent a couple hours in our first meeting, talking about Star Wars, Mexican food and falling in love with our Surprise-Birthday-Wedding ideas. On the day, they made us feel comfortable standing in front of the camera, capturing Ben and I exactly how we are, no fake cheesy grins or structured poses. Just capturing the moment with a very laid back approach that we both appreciate. I LOVE movies; watching them, finding out news about new ones, collecting memorabilia, everything! I’d really like to be in a movie one day, just if you know anyone? Reading is another addiction that possibly fills up a bit too much of my time. I enjoy grabbing my kindle and hiding under a blanket to read in my spare time. And I’m slowly writing my first novel, which is very much a fun and interesting process for me. I love hanging out with my friends and heading to the cinema, or a new restaurant, or occasionally some light mountain climbing (not with ropes or anything). And, of course, spending time with my awesome family is high on the list. My number one thing to do in my spare time… TRAVEL! Photography has started to take us to a few new places, which has been a blessing, but I’ve got many more places to explore. My bucket list is pretty much just a picture of the world. I LOVE sushi, I love pancakes, and Thai food is a favourite too. I make an amazing white choc and raspberry cheesecake… mmmm, cheesecake! Not a huge fan of hot & spicy stuff like Glen, but I definitely do love a good (mild) curry or stir-fry. I’m pretty lucky that Glen’s a good cook (better than me, but don’t tell him tho) and we enjoy cooking together in the kitchen (and usually dancing stupidly to music while we do). Glen. I know it sounds sappy, but he really is an answer to my prayers. I honestly don’t know what I’d do without him. My family, of course, I’m crazy lucky that I can say I have an awesome family, in-laws, extended, cousins, aunts and uncles – they’re all fun people that all get along and I love it. That I was born in a free country and can travel if I wish. Laughter. Love. Honesty. Faith. I am also very passionate about stopping child slavery and prostitution. An organisation whose work I’m passionate about is themandalayprojects.net. They do amazing work, and they need our support.